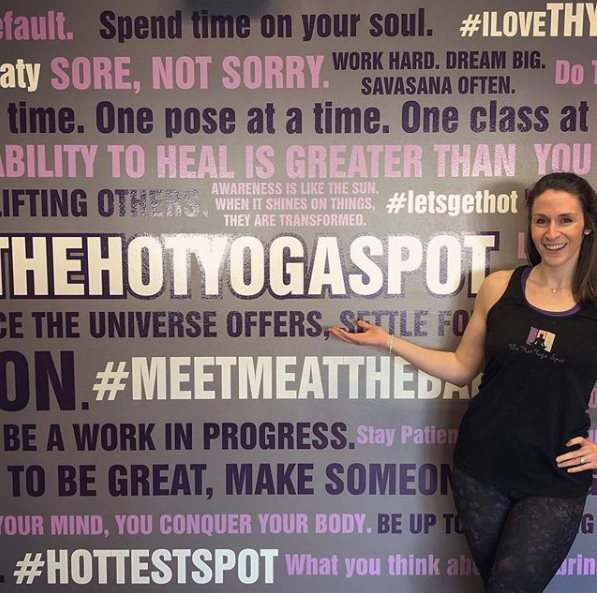 Albany, NY – The Hot Yoga Spot (THYS), the area’s premier yoga and fitness facility with five local studios, has again expanded its Albany location, which will serve as headquarters and training center for the newly created The Hot Yoga Spot franchise. For the past year, owner Jessica Fuller has worked with a franchise development team to expand THYS brand. THYS is the first woman-owned, fitness franchise to be founded in Albany. What was once a simple, single yoga studio located in Stuyvesant Plaza, is now the site of four. The newly opened Sky studio joins Sun, Moon and Stars, while increasing the overall space to 7,500 square feet. Fuller has twice renovated this site since 2011, less than a year after THYS opened. With this third and most recent expansion, the fourth studio at THYS will hold anti-gravity, aerial yoga sessions. With 16 hammocks secured to the ceiling, the aptly named Sky studio will allow students to experience a gentle practice while floating above their mat. Unlike the other studios, which are typically warmed between 90-105 degrees, Sky will not be heated and Fuller intends to use the room for special events, seminars, workshops, non-hot yoga classes and training for franchisees. With the aerial classes now on the schedule, the weekly class offerings at Stuyvesant Plaza has increased to 75, bumping the number of opportunities to practice across all locations to more than 200. THYS’s robust schedule includes Bikram, Baptiste, traditional vinyasa, yin, meditation and barre. The updates also bring additional locker space and changing areas, designed to provide a spa-like atmosphere with its state-of-the-art showers, lighting, mirrors and vegan, cruelty-free toiletries. As many students are squeezing classes in between other commitments, Fuller believes the ability to more easily prepare for their next obligation will lessen their overall stress and allow them to better enjoy their practice. An area has been carved out for the most dedicated yogis to store their mats and THYS boutique will showcase exclusive apparel, yoga mats, towels, journals and other branded goods. Fuller, who can be found greeting students nearly every day as they check in for class, remains committed to the welcoming, inclusive environment she has created. In addition to these enhancements, Fuller recently introduced her newest venture, BARE, offering acai bowls, cold-pressed juice and fresh fruit and veggie smoothies, one of which she named after her son. Fuller, a self-described health enthusiast, found that students like her were often seeking a way to replenish after class with a quality snack. BARE’s entrance is conveniently located next to THYS. To further her wellness mission, Fuller has partnered with the owners of Requiescent Float Center and has introduced this increasingly popular relaxation experience to THYS. Floatation therapy, also referred to as sensory deprivation, is the ideal complement to yoga, as its body and mind benefits are many. Those who float find relief from sore muscles and discomfort and some have found the process decreases stress levels while creating a sense of peace as they use the time to meditate and reset. Requiescent has installed two chambers, each filled with just 10-inches of body-temperature water and 1,200 lbs. of Epsom salt. Both tanks are soundproof and private, so floaters will not be disturbed. With these renovations now complete, Fuller has no intentions of slowing down and expects to open another location in the coming months. In addition to the Albany headquarters, the other Upstate, NY studios are in Clifton Park, Latham, East Greenbush and Saratoga. Founded in 2010 by Jessica Fuller, The Hot Yoga Spot offers a warm atmosphere, talented instructors and a caring staff. For more information, please visit our website.